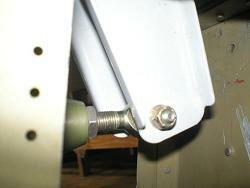 I would suggest you wait on elevator rigging until you are done with the other things in the aft end of the fuselage. I would complete all the electric wiring, static system installation, and riveting the turtle deck skin. 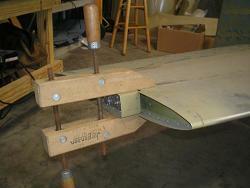 Once the elevator control pushrods are in place, there isn’t much space in the tail. I rigged my elevators from the back of the plane working forward, starting at the elevators themselves and ending with the front stick. 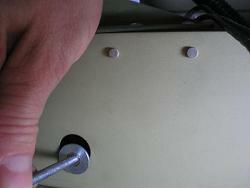 Start by clamping the elevators in the neutral or trail position. You can put a drill bit or dowel into each alignment hole in the end of the stab and elevator and use a level if you still have the fuselage leveled, or a straightedge if you don’t. Another method, and the one I used, is to clamp the elevator to the stab with the top and bottom of the counterbalance arm skins even with the top and bottom stab skins. I used a large wood clamp to ensure it was aligned top and bottom. Connect the F-841 pushrod to the elevator control horns, but don’t connect it to the F635 bellcrank just yet. First you will want to ensure the F-635 bellcrank is in the neutral position to allow you to adjust the lengths of the pushrods. I measured 3 1/16 from the F-808 bulkhead per the plans by clamping a piece of angle across the back of the bulkhead, then measuring from it to the center of the top hole in the F-635. I also made a little “jig” using some washers that filled the access hole in the F-818 ribs and left a small center hole that I could align with the lower hole in the F-635. I made sure a short piece of threaded rod fit through the center hole of the “jig”, into the bottom holes of the F-635, and through the other “jig” on the opposite side. With this in place, and the measurement from the bulkhead, I was happy that the bellcrank was neutral. 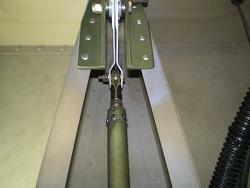 Now that the elevators and the F-635 bellcrank are both in the neutral position, you can set the length of the F-841 pushrod to align the rod end bearing with the upper holes in the bellcrank. 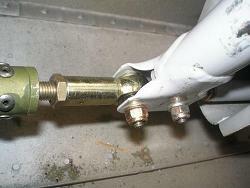 Tighten the jam nut and install the F-841 pushrod to the bellcrank. Connect the aft end of the F-840 pushrod to the bottom of the bellcrank. Set the aft stick to the neutral position. I had the plane leveled when I did my elevator rigging, so I used a level on the side and front of the stick to ensure it was neutral. 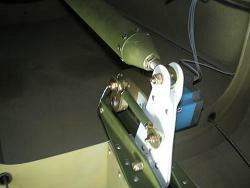 Then adjust the length of the F-840 to align with the aft hole in the WD-412A lower rear stick. Tighten the jam nuts and tighten the bolts for the F-840. Those same two holes I used for the “jig” allowed me to use two sockets and short extensions to tighten the nut on the aft end of the pushrod. Now you can insert the F-839 pushrod and front stick. You can again use levels to set the front stick to neutral, or just measure from the top and bottom of the rear stick to the top and bottom of the front stick. When the two measurements are the same, the sticks are neutral. If you haven’t already bent and/or cut the front stick, remove it before checking the freedom of movement of the controls. It will hit the instrument panel if you don’t. Unclamp everything and check full range of motion. Check that the elevators move to the up and down stops and that they are traveling within 25-30° up and 20-25° down.